Having a stocked fridge is even more important during a Staycation than regular week, as it seems someone is always in the kitchen searching for food… so for dinner I roasted a whole bunch of favorite vegetables and made made breaded chicken cutlet to get us through a day or two. We made carrot fries, roasted broccoli, roasted turmeric cauliflower, roasted chickpeas, roasted potatoes. 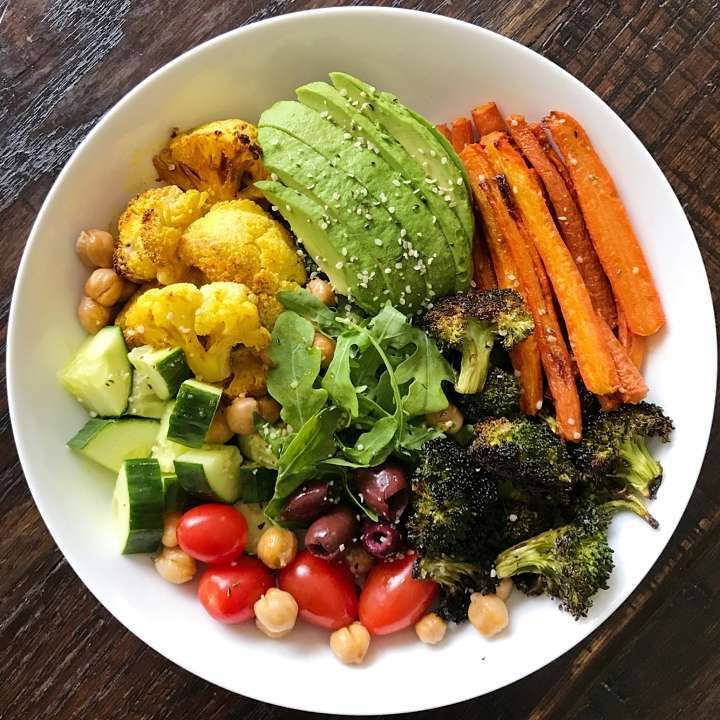 The boys ate chicken, potatoes and assorted veggies while this was my plate… all the roasted veggies, some fresh cucumbers, tomatoes and arugula, 1/2 an avocado, olives + a post-photo big drizzle of tahini. Roasted and Fresh Vegetables with a big drizzle of tahini is always a good idea. Savory, nourishing and delicious. The quantities below will give you extra for the week. Preheat oven to 400°F and line 4 baking sheets with parchment paper or do in batches. Roasted Carrots - 30 minutes or until getting cripsy, flipping once midway through. Roasted Chickpeas, 15-25 minutes. I prefer them only slightly crisp so usually remove at about 15 minutes. For crispier chickpeas, cook 20-25 minutes. Roasted Turmeric Cauliflower: In a small bowl, toss cauliflower in a small amount of olive oil and turmeric. Place in a single layer on baking sheet. Sprinkle with salt and pepper to taste. Bake 30 minutes or until tender and crispy on edges. Place all ingredients except the water in a food processor or small blender. Add ¼ cup water and process until smooth, about 1 minute. Scrape down the sides as needed and add more water, ¼ cup at a time to get desired consistency. The amount of water may depend on the consistency of your tahini. I tend you end up using ¾ cup water to get the consistency I prefer. Taste and adjust to taste, adding more lemon juice or salt as desired.